What War Will Come Next? Who Will The Zionists Attack Next? 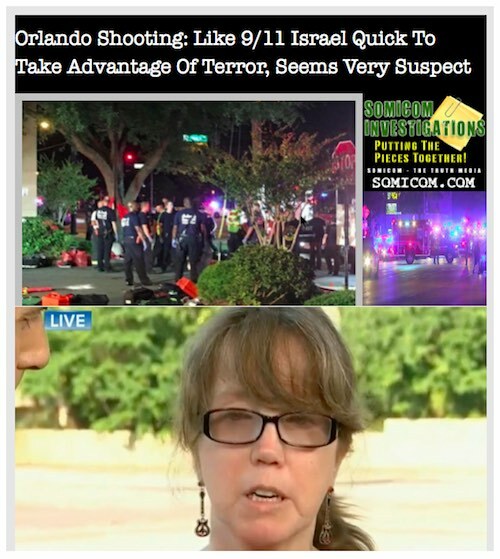 Some Anomalies: Orlando LGBT Shooting – Proof Of False Flag Event? Watch As Mom Reads Script. Pauses To Look Down. Gun Grab agenda in place as previous false flags. Orlando Mass Shooting! False flag event? YES! Orlando Shooting: Why Israel Availed the Vicious Circle of Terrorism? However, it is the deadliest mass shooting in the US and the nation’s worst terror attack since 9/11. After the terror attacks in Paris and Belgium, the opinion of Christians, Jews and Muslims is sharply divided in accordance with their own peculiar religious background. Prejudice is ruining so high against one another that by reading the name, some people of the opposite side ignore his views. This division can be noted on the social media. In fact, fault cannot be laid on the general masses, a majority of whom does not have much time to go in-depth. Hence, they are swayed by emotions, stereotypes and prejudices created by the political leaders who keep on manipulating any crisis for their own self-interests with the sole aim of getting their sympathies to increase their vote bank. There are equal strong pressures from religious and nationalist forces in wake of global war on terror which is dividing the world on religious lines. Experience of the recent acts of terrorism show that general masses start pointing fingers at the ISIS, without going into depth to know as to who (Entity) is behind this outfit, as to what the aims that entity wants to achieve, and what is the secret game in this regard. In these terms, we need realistic analysis to detect the real culprits who were behind the shooting at the nightclub in Florida. However, before the November 13 terror attacks in Paris some Western intelligence agencies had warned about these assaults and that warning was manipulated by Israel, as Tel Aviv wanted to obtain a number of secret aims owing to various developments. In order to revive the global war on terror, the neo-conservatives, Zionists and Israel needed the backing of the whole Europe against the Russian-led coalition of Iran, Iraq, the Syrian army-the National Defense Forces (NDF) and Lebanon-based Hezbollah, which had broken the backbone of the US-CIA-assisted ISIS terrorists, Al-Qaeda’s Al-Nusra Front and the rebels who have been fighting to oust the Syrian President Assad’s government and against the current Iraqi regime as part of America’s double game to obtain Israeli interests. Moscow also exposed the smuggling of oil by ISIS-controlled regions of Iraq to some European countries and inaction of their governments including America in this respect. It is mentionable that by ignoring Israeli protest, some EU member states like France and Belgian had officially recognizing a state of Palestine. The positive impact of this recognition was that EU pressure was growing on Tel Aviv for the two-state solution of the Israeli-Palestinian dispute and to restart a negotiation process. Some other developments like reluctance of NATO countries to support America’s fake global war on terror and acceptance of Syrian refugees by the European countries, especially Germany and the EU rule to boycott goods produced in Israeli settlements on the West Bank irritated the Israelis. In this context, connections of the Israeli secret agency Mossad are also notable. In March 2015, Iraqi Special Forces pointed out that they had arrested several ISIS’s foreign military advisors, including American, Israeli and Arab nationals and four foreign passports in an operation in Mosul. Last year, a senior aide to Russian President Vladimir Putin also stated that Mossad is training ISIS terrorists, operating in Iraq and Syria. Meanwhile, arrest of Israeli Col. Shahak in Iraq, his admission, proving links of Al-Qaeda and ISIS with America and Mossad and medical treatment of the ISIS warriors in the Israeli hospitals might be cited as instance. ISIS which was already being assisted by the CIA and Mossad was directed to send its militants in Paris and in connivance with the home-grown terrorists to conduct terror attacks in Paris. Mossad links with the ISIS terrorists can also be judged from the fact that this terrorist outfit conducted several suicide assaults and bomb blasts in Syria, Iraq, Yemen and Afghanistan, including the latest one in Beirut(On June 12). But, it did not target Israel. Nevertheless, Israel achieved its several sinister designs in the post-Paris attacks phenomena and after the shooting at San Bernardino, California. Like the drastic aftermath of 9/11 tragedy, rulers and politicians of the US and European countries, including their media started misguiding their general public by creating chauvinism against the Muslims. In this context, Republican presidential nominee Donald J. Trump had called for a ban on Muslims, entering the United States. After the Paris terror attacks, Israel-led America also obtained the support of its Western allies (NATO) against Russia. American jet fighters and those of its Western coalition started targeting the ISIS terrorists in Iraq and Syria. Meanwhile, Russian President Vladimir Putin displayed as to how fight the ISIS and Al-Qaeda, as Russian military compelled these terrorist groups to vacate most of the regions of Iraq and Syria. On March 14, 2016, Putin’s announcement to withdraw most of the Russian forces from Syria, after strengthening the Assad regime, while emphasizing upon the political solution of the Syrian crisis gave a setback to the US-led Western allies. In these circumstances, by manipulating the warnings of the Western intelligence agencies, on March 22, 2016, with the help of ISIS and Mossad, Israel again targetted Europe by arranging the Brussels blasts in order to avoid the settlement of the Israeli-Palestinian issue, and to implicate Syria-based ISIS—to thwart the UNO-backed ceasefire agreement about Syrian war which was brokered by the major powers including Russia and the US, and to cause a major rift between Russia and the US-led NATO, while provoking the Western Christians against the Muslims. Protests and violence have become commonplace at the Greek border, where more than 50,000 refugees have been stranded since Macedonia and other Balkan countries shut their borders in February. On May 7, 2016, hundreds of pro-refugee activists who came to Brenner mountain pass from other Italian regions as well as from Germany, Italy and Spain spurred unrest in protest of the closure of the Austrian-Italian border. However, these double standards of the US-led West will result into recruitment of more terrorists by the militant groups like ISIS on global and regional level. This is what Tel Aviv wants. Differences have arisen among the European countries in relation to the refugees and the asylum-seekers. Austria’s plan to build a fence along its border with Italy has been met with disapproval by Italy and Germany. In the meantime, in March, this year, Syrian fighters with the support of popular volunteer combatants liberated more towns from the ISIS militants’ control like the Thayyem Oil Field, especially the ancient city of Palmyra, and may recapture the group’s self-proclaimed caliphate-capital in Raqqa. As part of the US double game, Syrian rebel groups on April 12, 2016 launched a major offensive on positions of the ISIS in Syria’s northern province of Aleppo. In order to show to the international community and Western public that America is fighting against the ISIS terrorists, US has accelerated air strikes on the ISIS-controlled regions. As per CIA directions, in Aleppo city, shell and mortar attacks by the Al-Nusra Front, ISIS and the rebel groups have continued on the Kurdish neighborhood of Sheikh Maqsoud. ISIS has also continued firing rockets across the border into the Turkish town of Kilis. In the pretext, the Turkish military is retaliating with shell fire. It shows that the US and Israel have created a very complicated situation in Syria and in the vulnerable countries of the Middle East including Turkey by making a vicious circle of terrorism; so that American-Israeli covert aims in Syria could be justified, which could also get the favour of the Western countries which are already biased against Assad’s government. It is noteworthy that the US-led West, especially Europe has already started a new Cold War with Russia. The US has decided to station permanently additional troops in Eastern Europe as part of NATO move to defend the continent against the presumed threat of Moscow. In response, Moscow also responded that it would send 30,000 Russian troops along its western and southern borders. Although Cold War has revived between the US-led West and Russia, yet some recent developments have further disheartened the Zionist-Israeli-led America. On May 2, 2016, US Secretary of State John Kerry who opened a second day of talks in Geneva, stated, “The United States and Russia have agreed to make sure that there is more accountability to enforce the cessation of hostilities on a day-to-day basis.” On May 3, 2016, after negotiations, Moscow and Washington agreed for a ceasefire in Aleppo. The US and Israel think that before Syrian forces-backed by Russia occupy more territories, especially Aleppo which is strategically important and is industrial capital of Syria, rebel groups and ISIS should be given a free hand to continue fighting. Besides, movement of the left-wing parties which welcome the refugees is also becoming popular in the West, particularly Europe in response to the far right-wing groups. British Prime Minister David Cameron had sparked a furious row over the contest for the May 5, 2016 election of London mayoralty after he accused Labour candidate Sadiq Khan of sharing a platform with Islamic extremists and a supporter of the ISIS. During the debate in the House of Commons, Angry Labour MPs accused Cameron of racism. Despite it, Londoners elected their first Muslim mayor of Pakistan’s origin Sadiq Khan by defeating the Conservative rival Zac Goldsmith-a wealthy Jew. The TTIP leak by Greenpeace on May, 2, 2016, relating to a sweeping free trade agreement under negotiation by the EU and the US has shown how US can pressure EU to compromise health and the environment under trade deal. It is of particular attention that US internal problems such as curtailment of liberties, failure of the Obamacare, criticism of Hilary Clinton about contributions of election-campaign from Wall Street backers, email-scandal etc. disappointed the Obama Administration. While in wake of the election-campaign, Republicans and American public have also been criticizing the government of Democrats and CIA for America’s (NATO) longest war in Afghanistan, facing defeatism, useless proxy wars under the cover of global war on terror and US heavy cost of war which caused serious financial crisis, adding to the dilemmas of Americans. Owing to its confused policies, Obama Administration was pressing Israeli Prime Minister Benjamin Netanyahu to agree for the two-state solution of the Israeli-Palestinian dispute. A majority of the intellectuals and analysts of the West have also been emphasizing upon the settlement of this dispute. Here, it is also of particular attention that since the fundamentalist party BJP led by the Indian Prime Minister Narindra Modi came to power in India, it has been implementing anti-Muslim and anti-Pakistan agenda. India which has strategic partnership with Israel has perennially been manipulating the double standards of the US-led West regarding world phenomena of terrorism in connection with Pakistan and Afghanistan, while exploiting their anti-Muslim approach to obtain Indo-Israeli secret designs. Both Tel Aviv and New Delhi have been equating the ‘wars of liberation’ in Palestine and Kashmir with terrorism. Their main purpose is to divert the attention of the West from their own atrocities, while employing delaying tactics in the solution of these issues. Meanwhile, with the help of Pakistan, a series of meetings were held in Islamabad and Kabul among the representatives of Pakistan, Afghanistan, China and the US to develop an understanding for the earliest possible resumption of stalled talks between the Afghan government and the Taliban with view to ending nearly 15 years of bloodshed in Afghanistan. Trust deficit has deepened between Pakistan and the US since May 21, 2016, when the CIA-operated drone strike killed the Chief of the Afghan Taliban Mullah Akhtar Mansour in Pakistan’s province of Balochistan. However, CIA, Mossad and Indian RAW succeeded in sabotaging the peace process between the Afghan officials and representatives of Tehreek-e-Taliban Afghanistan, as the latter refused to continue peace talks. India and Israeli want to prolong the stay of the US-led NATO in Afghanistan, as their desperation in Afghanistan had increased in the backdrop of growing engagements of Islamabad, Kabul, Beijing and Washington. Particularly, fast growing economic power of China coupled with her rising strategic relationship with the Third World, and especially Pakistan—after signing of the agreement, ”China-Pakistan Economic Corridor” has irked the eyes of Americans, Indians and some major European countries. In case of Afghanistan, there are several groups of Al-Qaeda, ISIS and Taliban. Some of them are being used by CIA, Mossad and RAW to obtain the collective and individual designs of their countries against Pakistan, China, Iran and the Middle East. The terrorists of ISIS and TTP which are strategic assets of the CIA, RAW and Mossad in Afghanistan have claimed responsibility for several terror attacks inside Afghanistan and Pakistan. While in some cases, with the help of Tehreek-i-Taliban Pakistan (TTP) and ISIS, Mossad and RAW are collectively arranging terror attacks in Afghanistan to create further lawlessness in that country because it suits their clandestine interests. Like Russian-led forces in Syria, Pakistan’s Armed Forces broke the backbone of the militants through military operation Zarb-i-Azb—killing thousands of insurgents including foreign terrorists. Therefore, this development has also surprised CIA, Mossad and RAW whose agents have well-established their networks in Afghanistan and are determined to thwart the success, achieved by Pakistan’s armed forces against terrorists. It is worth-mentioning that America’s anti-Muslim, pro-Israeli and pro-Indian Donald Trump has become the nominee of the Republican Party which has still to confirm his candidacy. Trump’s opposition to Muslim refugees, especially from Syria is well-known. During his appearance with the National Border Patrol Council’s Green Line radio show on May 15, 2016, Trump has predicted that refugees with ISIS-funded cell phones will conduct another 9/11-like terrorist attack in the US. During a GOP debate in December, 2016, he had already expressed similar thoughts by giving “Americans wakeup call about border security and to take it seriously,” elaborating that he had “no doubt, the attackers were already entering the country.” On February 14, 2016, CIA Director John Brennan warned that ISIS attacks on “U.S. soil is inevitable.” However, the purpose these warnings were exploited by Mossad and its affiliated CIA operatives to target the night club of Florida. Unlike the presidential nominee of the Democrats Hillary Clinton, Donald Trump suits the interests of Israeli. But, leaders of his own parties are opposing Trump’s nominee due to his extremist statements during the election-campaign in wake of secret documents, leaked by the Panamanian law firm Mossack Fonseca, which pointed out on that Trump empire is linked to 32 offshore companies, and thus, avoided taxes. In such situation, like the 9/11 type, Israel needed a new terror attack in the US to ensure the success of Trump in the forthcoming presidential elections. After the shooting at the gay night club in Florida, Donald Trump repeated his call for the President Obama to resign, slamming him for having “disgracefully refused to even say the words “Radical Islam.” Calling on Clinton to get out of the general election race for the same reason, Trump said, “Because our leaders are weak, I said this was going to happen…we cannot afford.” Trump again remarked that he would decrease immigration from the Middle East because “since 9/11, hundreds of migrants and their children have been implicated in terrorism in the United States.” He, once again, asked for the ban of any Muslims, entering the U.S. Nonetheless, we can conclude without any doubt that CIA, RAW and Mossad might be in collaboration in conducting shooting at the nightclub in Florida by using the ISIS militant so as to obtain the collective interest of their countries. Israeli Mossad could also be in connivance with Indian RAW in this respect. And most probably, by availing the vicious circle of terrorism, Mossad might have arranged this massive shooting due to differences among the EU countries, refugee crisis and to fortify the US alliance with the Western countries, particularly Europe, to divert the attention of American public from internal problems, prolonged war on terror etc., and especially to avoid the solution of the Israeli-Palestinian issue. Therefore, in the post-Florida terror attack, instead of repeating the 9/11 aftermath like the anti-Muslim rhetoric, while pursuing secret states’ strategies of the past in the modern era, the US leaders and policy makers must follow realistic approach by thinking on these lines. They need to detect especially the role of Mossad which would continue to target the innocent Americans by conducting more terror attacks through the ISIS terrorists. They must also seek solution of the Syrian and Palestinian crises, including the Kashmir dispute. While, loyalist Americans, non-Zionist Jews and peace-loving citizens of every other religious community should play their positive role for world peace by stopping the division of the international community on religious and cultural lines.